Sexual harassment has scared people so much they’re afraid to compliment a woman’s eyes, hair, etc. I have the arms of a god. It all began years ago when a guy tried to pick me up by complimenting my arms. Seriously. 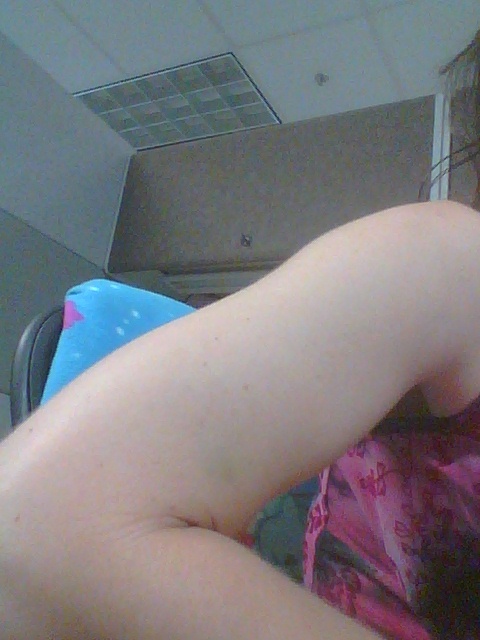 Then JM complimented my arms at BlogHer. More arm compliments by Jules, Darla, and Jess in last month’s comments. Ladies, this is for you. I’ve been a slacker lately, so they’re not muscular as they usually are. And sorry about the bruise. Damn blood draws. But now I have a new hypothesis. What if I’m just a very dull person? What if my arms are my only attractive trait? The only other things I receive compliments on are fake. Gym Guy: You’re looking beautiful today. As always. You have the most perfectly shaped eyebrows. Now seems like a good time to mention I don’t take compliments well. I end up (A) blushing and changing the subject, or (B) oversharing. Just saying, “Thank you” rarely happens. Gym Guy: And your lashes are so long! Me: They’re fake. I glue the extra eyebrows to the lashes. It’s all fake! At least my hair is real. I might try brushing it this morning to see if anyone says anything. Haaaaaave you met Peg? She’s pretty much a genius. She has good ideas and is a great organizer. How do I know this? Because she orchestrated the great Reese’s Cup Takeover of 2012, and now she’s giving credit where credit is due with her Freshly Pegged Awards. Please give Peg a warm welcome! And she’ll probably accept Reese’s Cups, too. When Thoughtsy asked me to review a movie for her landmark “Movies Teach Us” series, I thought I might be hamstrung by the fact that I never actually WATCH movies. This is a result of being unwilling to shell out the $10 and 3 hours required to go to a show, coupled with my inability to figure out why the sound won’t work on our DVD player. Being a genial host, Thoughtsy said I could just resurrect impressions gleaned from something I’ve already seen. I chose Romy & Michele’s High School Reunion. Those who know me might find this an odd choice for a grumpy, middle-aged woman, but I loved this movie. To paraphrase one of the mean girls (who ends up breaking away from the pack to become a pseudo-butch, not-mean career woman), it’s flirty and fun. 1) When making up a career to disguise the fact that you are actually a broke loser, don’t pick something people are apt to have heard of, like inventing Post-it Notes. Say you got rich doing something nobody can disprove, like owning a huge chain of coin-op laundromats. 2) Desperately Seeking Susan had a profound effect on the styling adopted by high school girls desperate to be different in the pre-EMO days of the 1980s. 3) Girls who hang around their hometown and remain friends after high school are doomed to all get pregnant at the same time. 4) Janeane Garofalo used to be funny before she made the career switch from comedian to obnoxious political pundit. 5) No need to feel inferior in high school: the Big Man On Campus and Head Cheerleader always wind up being fat losers by the ten-year reunion. 6) Conversely, nerds always turn out cute/hunky and end up making lots of money. 7) In the food chain that is the high-school social scene, there will always be people above you. But don’t despair. For almost everyone, there is still somebody below you.